It’s been 23 years since I was last in Austria but, since I didn’t come to the university city of Graz as a backpacker, I can’t tell you if it has changed much in that time. Although I’m pretty certain there wouldn’t have been many, if any, excellent minimalist coffee dispensaries then. Leroy and I stopped in to café Tribeka on the river Mur for a quick tomato and mozzarella bagel and a fortifying shot of caffeine, which was much needed after birthday drinks with friends last night. 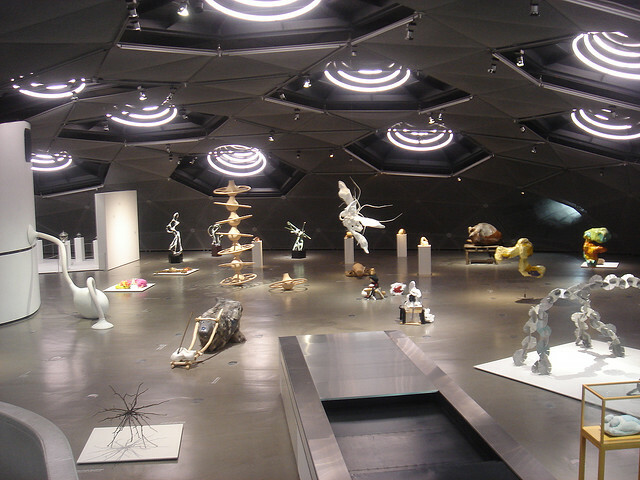 Once we had our bearings, we set out into the World Heritage-listed old town in search of the Kunsthaus Graz, a striking art museum built in 2003 in honour of Graz’s year in the spotlight as European Capital of Culture. We didn’t have to look for long. We literally stepped out of the cafe, looked left and there it was. The organ-shaped, alien spaceship of a building squats amongst the medieval buildings like some sort of giant metallic toad. And I don’t necessarily mean that as an insult, although the jury is technically still out on this one. 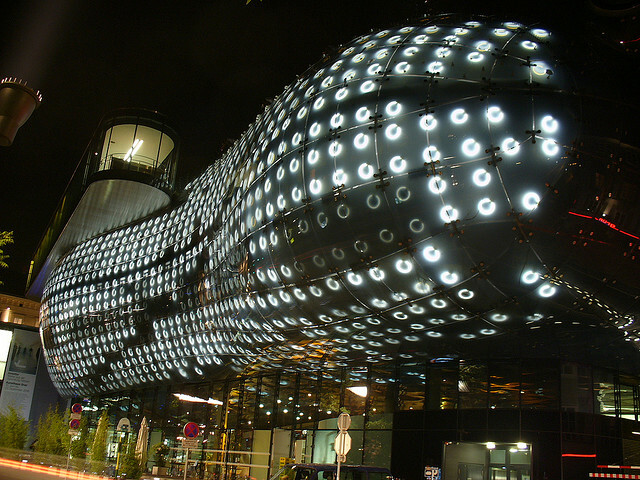 Powered by its solar panel cladding and embedded with around 1000 programmable fluorescent rings, it’s certainly one of a kind. A shame we won’t be here at night to see it all lit up. Much to our delight, the inside was fairly wacky as well. From Graz we headed 200km north to Vienna (travel time: 00.00), stopping off at the edge of Lainzer Tiergarten – an enormous wildlife sanctuary and woodland – for the express purpose of visiting a church. No ordinary church, the Wotruba Church (pictured above) is a tiny Brutalist masterpiece designed as a homage to Chartres Cathedral, although you wouldn’t necessarily guess it from its appearance or its light-filled interior. Built on the site of a former Nazi barracks in the mid-1970s, the church is colloquially named after its architect, Fritz Wotruba. His ambition was to “design something that shows that poverty does not have to be ugly, that renunciation may be in an environment that is beautiful despite the greatest simplicity and makes you happy”. Leroy casually mentioned that he was keen to check out the Globe Museum in central Vienna. Quite partial to a globe myself (as you may have already guessed), I was happy to go along with his suggestion. Besides, he’d nobly agreed to accompany me on the architectural component of our day trip and it was only fair I tagged along for the museum part. My only stipulation was that we first call in to the opulent Hotel Sacher for a slice of their eponymous torte and more coffee. A cliche, perhaps, but a delicious one. 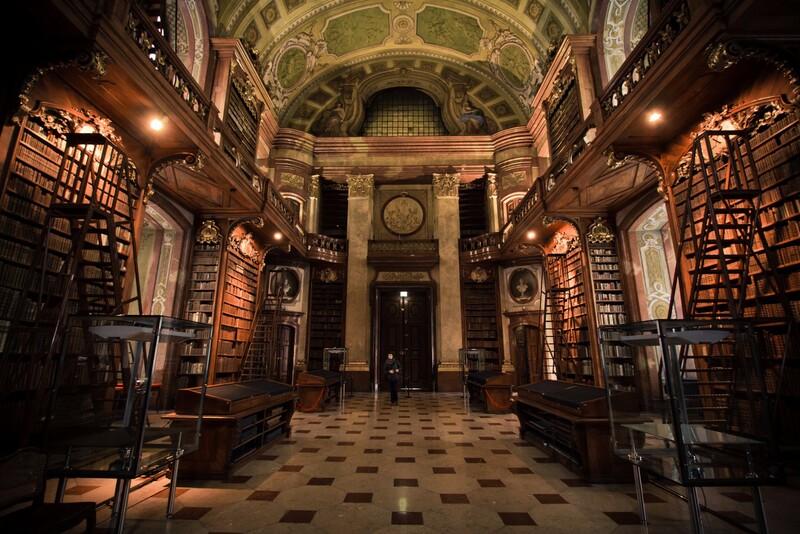 Part of the Austrian National Library, the Globe Museum at Herrengasse 9 is the world’s only dedicated public collection of globes, both earthly and celestial. Beautifully displayed globes of one shape and all sizes line the rooms; from tiny wooden golf ball-sized ones to other as tall as a person. There were even some made of fabric, designed to be inflated using bellows. All globed-out, we then headed off in search of Gasometer Town, a complex of re-purposed gas storage tanks that have been converted into apartments, shops and offices – and our home for the night. 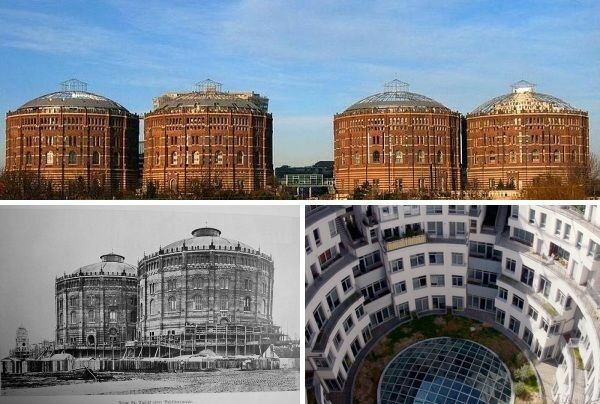 Built in the final years of the 19th century to store gas for Vienna’s street lamps, the four enormous Gaswerk Simmering tanks were in use for almost 90 years. We were lucky enough to hear of a friend (of a friend of a friend) whose uncle is a co-owner of a small apartment in the complex. Effectively we’ve done a sort of virtual house-swap for one night. We have now changed into our evening finery and have – somehow – summoned up energy for the remainder of our cultural exploration of Vienna. 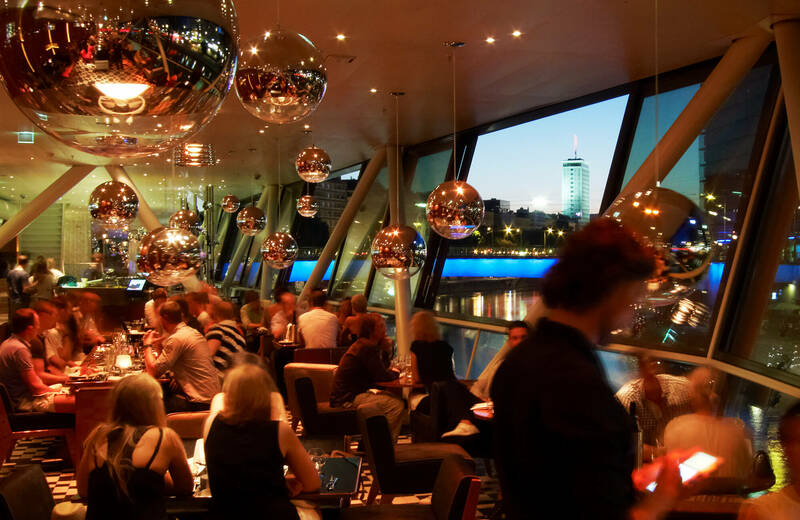 We’re having an early dinner at Motto am Fluss, a bistro overlooking the Danube Canal that is apparently on every urban hipster wish-list. We’re no urban hipsters, but tonight we’re getting away with it. It might be the Kerbelgnocchi (chervil gnocchi) for me, and glass of Sekt. Leroy is no doubt about to order some kind of animal fleisch and a hearty Austrian red. The reason for eating so early and dressing in finery is that we’re off to the opera. Yes, you heard that correctly. Thanks to a tip from the ticket seller at the Globe Museum, we’ve nabbed standing room tickets for the Vienna State Opera (Wien Staatsoper) to see L’Italiana in Algeri, an opera of which I know nothing at all. This is something I did 23 years ago as a backpacker and, while I didn’t cry as most people do in films when they see their first opera, I did enjoy the staging, the costumes and the music. And Leroy is always up for a new experience. My biggest surprise was that he didn’t suddenly confess to being a superbly schooled opera singer from somewhere during his well-travelled past. He looked surprised when I even brought it up as a possibility.